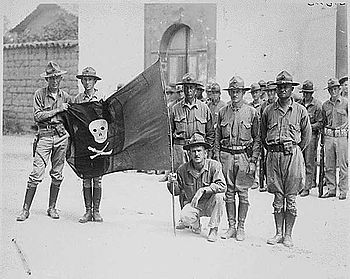 #AceHistoryNews says The Banana Wars were a series of occupations, police actions, and interventions involving the United States in Central America and the Caribbean between the Spanish–American War (1898) and the inception of the Good Neighbour Policy (1934). These military interventions were most often carried out by the United States Marine Corps. The Marines were involved so often that they developed a manual, The Strategy and Tactics of Small Wars, in 1921. On occasion, the Navy provided gunfire support and Army troops were also used. With the Treaty of Paris, Spain ceded control of Cuba, Puerto Rico, and the Philippines to the United States. Thereafter, the United States conducted military interventions in Panama, Honduras, Nicaragua, Mexico, Haiti, and the Dominican Republic. The series of conflicts only ended with the withdrawal of troops from Haiti under President Franklin D. Roosevelt. Reasons for these conflicts were varied but largely economic. The conflicts were called “Banana Wars”, a term that arose from the connections between these interventions and the preservation of American commercial interests in the region. Most prominently, the United Fruit Company had significant financial stakes in production of bananas, tobacco, sugar cane, and various other products throughout the Caribbean, Central America and Northern South America. The U.S. was also advancing its political interests, maintaining a sphere of influence and controlling the Panama Canal which it had recently built, critically important to global trade and naval power.